At GCDC, we push the envelope of science. If we weren't enticed by the glories of the engineering field, we would have followed the footsteps of Chuck Yeager as fighter jet test pilots. So, how far do we go? In this experiment, we put both an X6-2 accelerometer and a B1100-1 barometer inside a remote controlled airplane. That's right, two synchronized data loggers. And like any test pilot knows, pushing it too far can result in disastrous consequences. 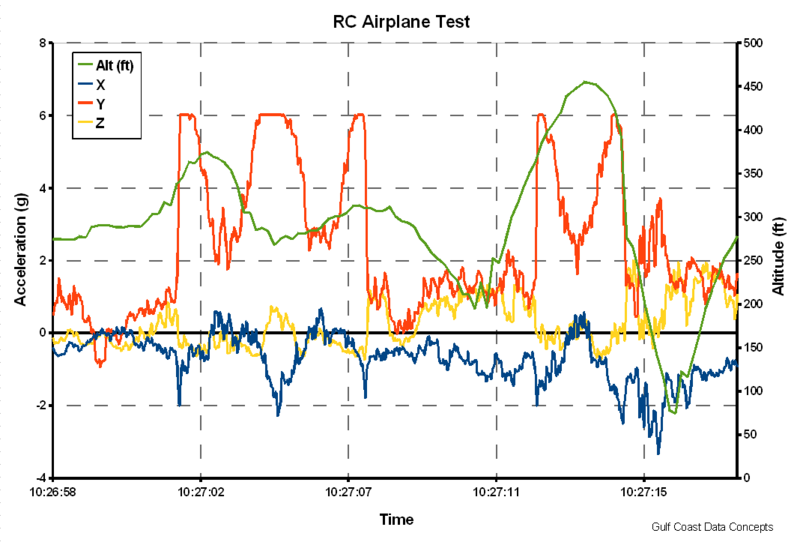 This experiment illustrates synchronized data from an X6-2 accelerometer and a B1100-1 barometer as flown in a small radio controlled airplane. 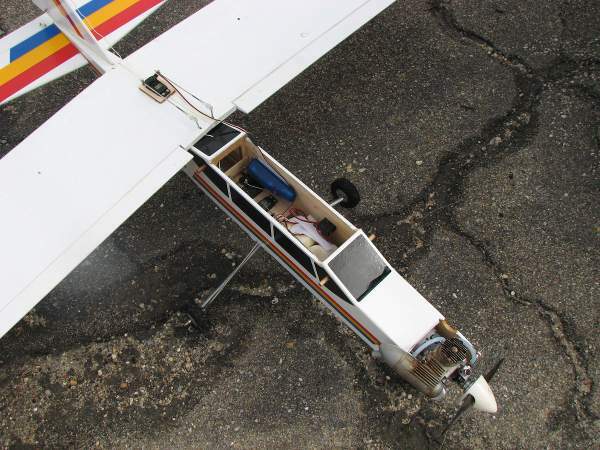 The X6-2 accelerometer unit was adhered to the inside compartment of the model airplane using double-sided tape. The barometer was placed towards the nose of the airplane, just behind the fuel tank. After a few warm-up test flights, our ace RC pilot was performing loops, inversions, and power dives. Unfortunately, not every test has a happy ending and this case was no exception. After a smooth descent into a level flight overhead, the RC plane was commanded into ascent...for the last time. The left wing ripped from the fuselage and the airplane cork-screwed uncontrollably into an awaiting oak tree. The smack and crackling noise of shattering balsa wood indicated a catastrophic landing. Rescue crews recovered the data loggers allowing later accident analysis. XLR8R was used to construct the absolute time entries for the data before importing into Excel. Figure 2 illustrates the take-off rate of ascent and acceleration and Figure 3 illustrates the acceleration profile and altitude changes during a loop. Finally, Figure 4 shows the final approach and uncontrolled impact into a tree. 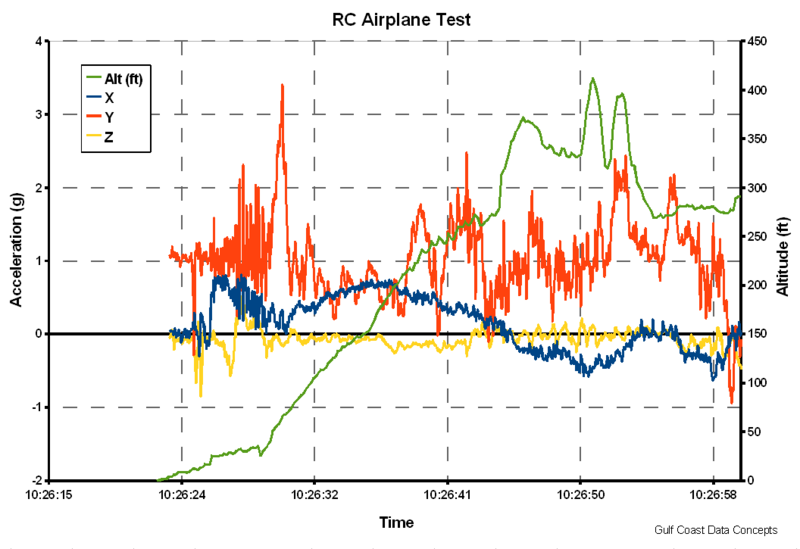 Pressure variation inside airplane compartment likely influenced the pressure readings. The ground speed acceleration before take-off indicated a rise in altitude of 30 ft. This suggests that the air speed around the airplane body caused a pressure drop inside the fuselage, which registered in the barometer. The phenomenon may also explain the ground level altitude at about 10:29:28, just before the loss of the wing. A maximum altitude of 435 feet was reached after taking into account the 30 feet error prior to take-off. 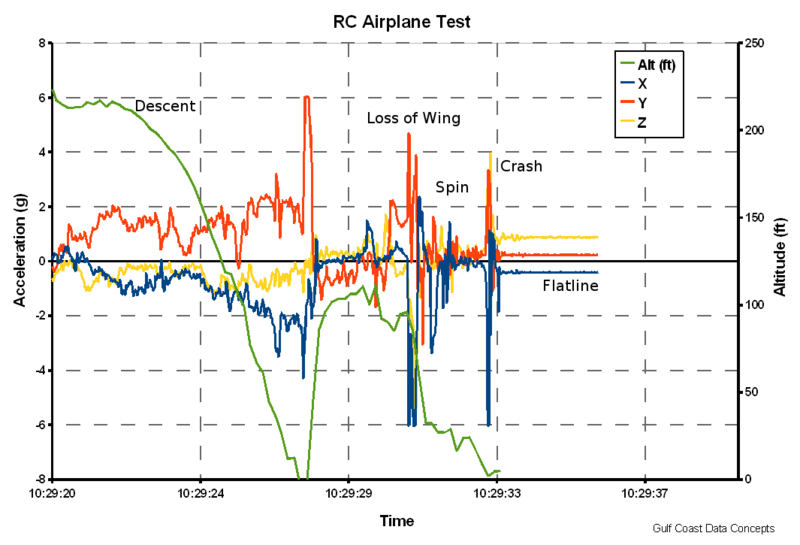 The take-off and ascent average 16 ft/min to an altitude of 250 ft. A second climb brought the airplane to about 350 ft.
Buckling of the main strut appears the most likely cause of the wing failure after the repeated loops and high-speed dives exceeding 6 g's. However, some accounts suggest that a well placed shot originating from a nearby grassy knoll may have compromised the wing. The "grassy knoll" theory lacks substantial evidence but is continually promoted by the pilot. 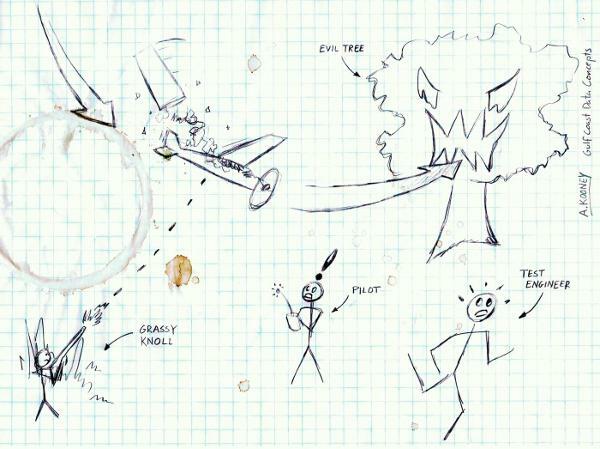 Eyewitness accounts and scientific evidence were compiled and a sketch of the events are illustrated below. Both the X6-2 and B1100-1 data loggers implement a very precise real-time clock that allows effective data synchronization. Multiple independent data loggers collecting precisely time-stamped data can provide a very informative reconstruction of complex test environments.